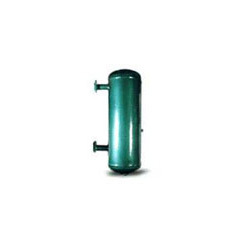 Vertical accumulators are made from Carbon Steel/low temp. plate shell and carbon steel/low temp. steel dished ends. Shells upto 300mm (12″) are made from seamless/welded pipes and above 300 mm, they are made from rolled plates. The diameters range from 250mm(10″) to 600mm (24″) and lengths vary from 1 Metre(3″) to 1.8 Metre(6″). Custom built accumulators can be made as per customers requirement.